July is nearly all gone and for me it went way too quickly. I had a nasty cough for most of the month and was bogged down with work. However, I did go to a baseball game, watched a drive-in movie from the back of a pick-up truck and drank beers on a sunny patio. Also, for the first time ever, we watched every single stage in the Tour de France, which was silly, exciting and just plain fun to watch. So what did I end up doing when faced with a screen filled with fit cyclists attacking the Pyrenees mountains by brute force and sheer athletic ability? Well, I ate coffee ice cream topped with this deliciously evil drunken caramel sauce. This sauce is dangerous. Not only is it boozy and has a good pinch of salt to counter the sweet, but the number one factor that makes it a true killer is that it’s way easy to make. In fact, I’m pretty sure you already have every single ingredient needed to dig into a bowl right now. It’s obviously great over ice cream (especially topped with roasted almonds and cocoa nibs), but I can see this being a brilliant topper over an apple pie or a peach tart. If you’re not into the booze, you can just leave it out and it will still be fantastic. And it’s vegan as long as you choose a good non-dairy margarine. See, I told you this caramel sauce was pure evil. Don’t worry too much about this little indulgence because my next post will be about turnips. Elsewhere: I’m using umeboshi vinegar again over at Poppytalk. Check out my recipe for an orzo pasta salad with baby bok choy. Over at ReadyMade I’m sharing the Community Sponsored Agriculture love – what do you make with your haul? In a small saucepan, melt the butter and brown sugar over medium heat until the butter is melted and the sugar has dissolved. Stir in the cinnamon and salt and mix until the sauce is smooth, about 5 minutes. Remove from heat and stir in the rum and vanilla. Cool slightly and serve. Any leftovers can be reheated in the microwave or by placing the bowl in hot water and giving things a stir until the sauce melts. Oh wow. I’m a disaster in the caramel making department and can’t wait to try this next time the salty sweet booze fix beckons. How do you think this would do in a caramel ice cream? Thanks for the inspiration–I am so glad I found your site. Not only am I going to make this tonight, I am going to start saying, “Don’t worry too much about this little indulgence because my next ____ will be about turnips” because, really: it can’t be said better. Heyyy, thanks for sharing the CSA love. 🙂 This sauce is redonkulous, and I’m pretty sure that even looking at pictures of it mitigates all the health benefits that my farmshare tomatoes have imparted. Oh, that sounds fantastic and dangerous as I pretty much always have those ingredients on hand. We make a sauce in my house that we call “Dream Gravy” that is a thick chocolate/peanut butter sauce for ice cream. This will be a good one to add to the rotation. ha ha! love it. i thought this was for the drunken chicken till i read ice cream. you know i totally thought of you when i made my latest creation of tomato salad. why? well i know you love crazy kicked up salad creations like me. i’ve been eating a lot of that coconut milk ice cream lately–it’s just so good!!! Yum! This is something I can see myself eating with a spoon. I once had a jar of fudge sauce in the fridge and everyday, I’d grab a spoon and dig in. 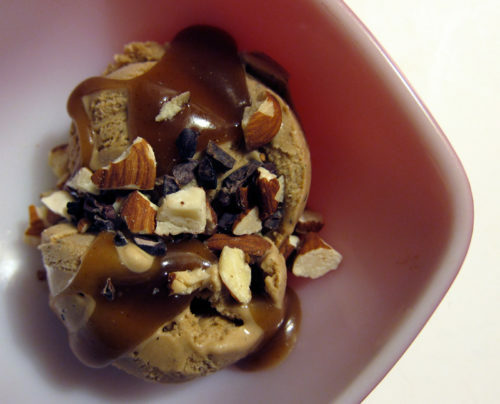 I really love the presentation of the ice cream with the sauce and the almonds. Now that is my idea of a satisfying dessert! This looks so delicious! 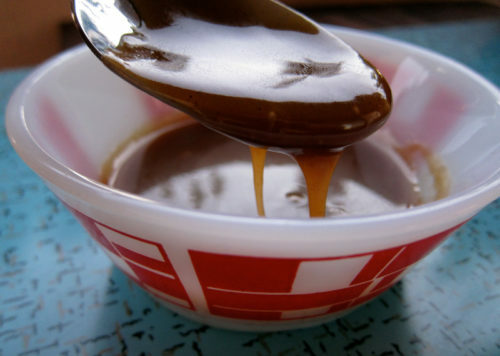 I have always been a little afraid of delving into the world of sweet sauces like caramel, but this looks so wonderful and simple I’ll just have to try it tomorrow! This is definitely one of the more evil things you’ve posted in a while. I’m only making this when I know I’ll have about ten boys around to devour most of it! Total evil. And that bowl is pure decadence. Jeez! it’s also great on bread pudding! i made this one a while back, and the sauce is really similar 🙂 YUM. This is my mom’s sauce! Well, sort of. Very, very close, and it’s the sauce she uses to command visits during the holidays, luring me away from the in-laws and their caramel-free, rum-free household. I hadn’t thought of it for summer. Why hadn’t I thought of it for summer?! Thanks so much for sharing! Oh F@#% me…i need to sop coming here..
*droooooool* That is such a tease. I love that this sauce doesn’t use any cream so you can pretty much make it any time! Are you serious? Rum and caramel TOGETHER? And it looks so easy….I have pots, I have butter, I have sugar….. This looks scary good. Your pictures are awesome. Elizabeth, I don’t think you could make a disaster out of this caramel. It’s a cinch. Haha, thanks Jen! It’s always about the turnips. No problem, Maddie. And glad you liked that salad. Maija, I love the sound of “dream gravy”. vanillasugar, I’ve got to get my hand on that coconut ice cream! Thanks Bijoux, it’s definitely satisfying on all levels. Jen, don’t be afraid…there’s nothing complex about it. Heather, that looks good. What can’t you pour this deliciousness on? 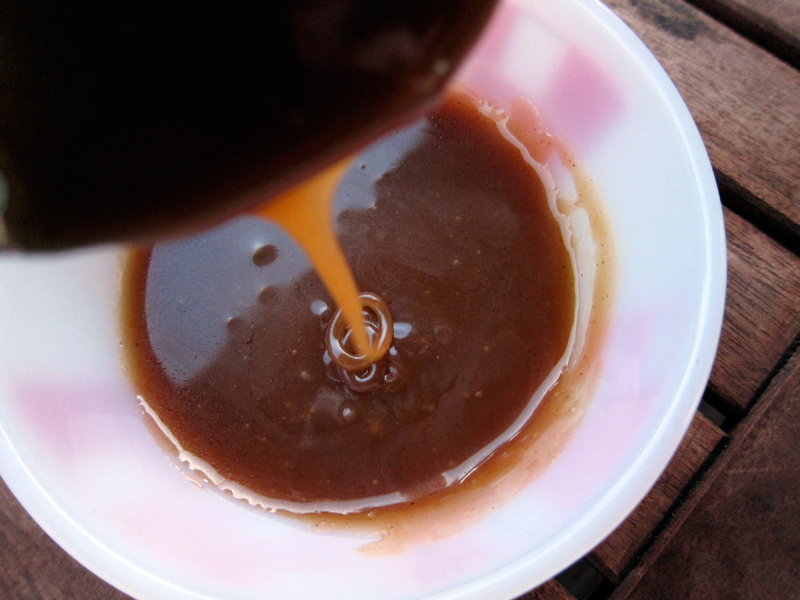 Emvandee, let those caramel dreams live on all year round! I can’t help myself, Tara. Yup, that’s a lovely bonus, Ashley. Jabba, it’s an easy sauce for sure. What are you waiting for??? Uh, that sounds pretty much like heaven, Lo!